Oh the sound of sweet victory! In the battle between dogs and cats, dogs won first place in the “best sniffers” competition. However, in the competition for “best hearing“, the gold metal goes to cats! What is it that makes those cute little cat ears so spectacular? Let’s find out. Manna lends us an ear to show us what’s inside. 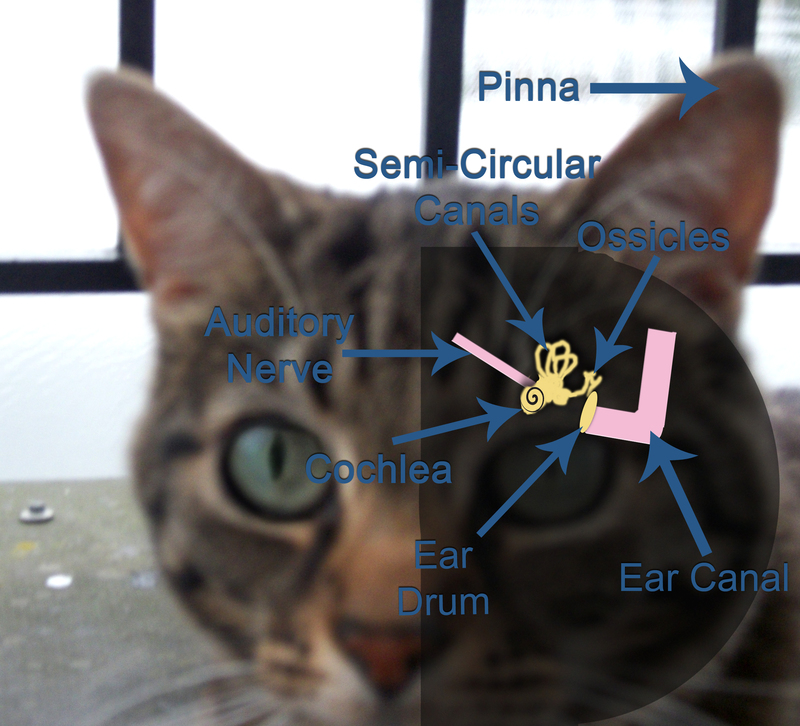 The Pinna is the cat’s outer ear. It is made of a thin piece of skin and it’s movements are controlled by 32 different muscles! The Ear Canal is the tube that funnels sound from the pinna into the middle and inner ear. The Ear Drum is another thin membrane that separates the outer part of the ear canal from the middle (the Ossicles) and inner ear (the Semi-Circular Canals, the Cochlea, and the Auditory Nerve). The function of the ear drum is to translate sounds from the ear canal to the ossicles (the next step in the process). The Ossicles are a set of 3 very small bones; the hammer, the anvil, and the stirrup. These bones rattle against one another to translate the sound on into the inner ear. 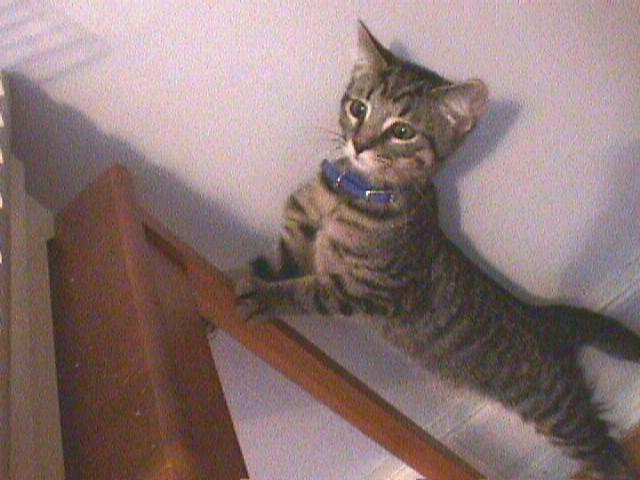 The Semi-Circular Canals are small tubes that are used to control the cat’s sense of balance. You may have noticed how the Semi-Circular Canals in your own inner ears (humans have these too) control you balance when you have spun in circles and been unable to stand up straight. This is because the spinning changed the way the fluids in the Semi-Circular Canals were positioned. You would be able to stand up straight again once the fluids settled back into their normal places. The Cochlea is a complicated, snail shell shaped organ that translates the sounds from the inner ear into electrical impulses to send along the Auditory Nerve. The Auditory Nerve is like an electrical wire that transfers the electrical impulses from the Cochlea to the auditory processing part of the brain. A cat’s outer ear works like a satellite dish, taking much more sound than the human ear and amplifying it. Those 32 muscles that control the Pinna make it so that the ears can rotate 180 degrees – independently- to pick up sounds from all around the cat. Cats also use the ability to move one ear independently of another to track where a sound is coming from. The time that it takes a sound to get from one ear to the other allows the cat to pinpoint an object that is 3 feet away within 3 inches of it’s location. Being able to locate sounds helps cats to efficiently hunt their prey. The range of pitches that a cat can hear is amazing. A human’s range of hearing is from 64 – 23,000 Hz (lower numbers are lower pitches, while higher numbers are higher pitches). Cat’s can far out hear humans with a range from 45 – 64,000 Hz! The part of a cat’s hearing range that is lower that what a human can hear (infrasonic sounds) make it possible for them to hear the rumbling of thunder and of earthquakes long before humans do. The range of a cat’s hearing above what a human can hear (ultrasonic sounds) make it possible for cats to hear rodents and insects that humans can not hear. Few other creatures can hear higher pitches than cats can (check out a comparison chart here). It is also hypothesized that the cat’s natural inclinations towards higher pitches are why they respond so well when humans raise the pitch of their voice while talking to them. Cinco (at 4 months) inspecting our cockatiel Doodles. Very intent listening.